Dying Salton Sea: Source of Mysterious Foul Odor? SANTA ANA (AP) — The saltwater lake that could be to blame for a rotten-egg stench that swept across the greater Los Angeles area Sept. 10 has bigger problems than its public image. The massive body of water, located 150 miles southeast of Los Angeles, is a dying lake that is plagued by increasing salinity, receding shorelines and periodic fish die-offs caused by plummeting oxygen levels in its briny waters. Regional air quality officials were awaiting test results at press time to determine if the recent widely reported stench came from the lake, but many experts have already stated that the Salton Sea was the culprit. A massive thunderstorm packing wind gusts of up to 60 mph late Sept. 9 could have churned up the sea’s bottom, releasing odorous bacteria from a recent fish die-off there, said Andrew Schlange, general manager of the Salton Sea Authority, the agency tasked with saving the sea. Winds carried the stench more than 100 miles, through Riverside and San Bernardino counties, through the San Fernando Valley and all the way to the Ventura County coast, in an event those familiar with the Salton Sea called unprecedented. 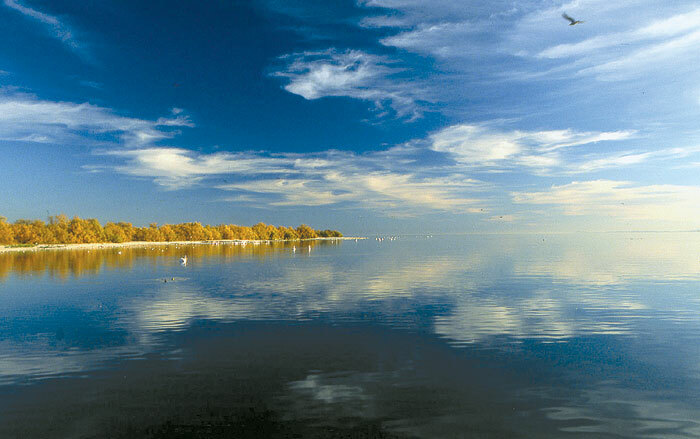 Created in 1905 when floodwaters broke through a Colorado River irrigation canal, the 376-square-mile Salton Sea is bigger than Lake Tahoe, but it is only 51 feet deep at its deepest spot and has no outlet to the ocean. Ninety percent of its water comes from agricultural runoff from the nearby Imperial, Coachella and Mexicali valleys — a fact that gives the lake its unique soup, but also causes its many problems. The lake, which is 235 feet below sea level, is currently 50 percent saltier than the ocean — and salinity levels are expected to increase even more as it shrinks. The rising salt level, however, has meant the demise in the past decade of several marine game fish species. The only species remaining are tilapia, which have gradually adapted to the saltwater, and desert pupfish, said Timothy Krantz, an environmental studies professor at the University of Redlands. The lake’s depth has dropped in recent years, creating exposed lakebed that generates dust. By 2018, the depth is expected to drop another 15 to 20 feet, exposing 140 square miles of lake bottom and its dust, Krantz said. The Salton Sea Authority has a plan to save the sea, but it has struggled for years to get funding and political muscle behind it. In 2006, various estimates put the cost between $3 billion and $9 billion, said Andrew Schlange, the authority’s general manager. The plan involves stabilizing the sea level by cutting the body of water in half and allowing part of it to dry up, he said. The dried lakebed could host extensive geothermal and solar fields that would mitigate the restoration cost and provide power for millions of homes. Officials would then work to reduce the salinity in the remaining lake.